Most Camellias we see for sale are hybrids, however species such as Camellia lapidea deserve more attention and wider use in the garden. Some are rarely offered for sale, yet are well worth seeking out. This species camellia is from China, and Camellia lapidea gives us beautiful pink flowers with contrasting golden stamens. Foliage is a glossy green with serrated margins. Flowers appear in small clusters and can reach 7 cm across. This is a Camellia that is rarely offered for sale, yet with very attractive open pink flowers held against the deep green foliage it does make an excellent fetter plant in the garden or in a container. C. lapidea is best grown in a position where the plant is protected from the heat of the afternoon sun. 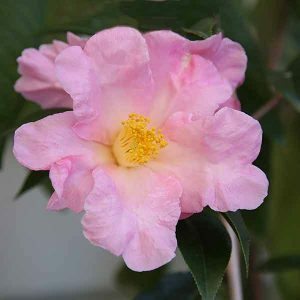 Once established, Camellia lapidea is remarkably hardy and very easy care. A humus rich slightly acidic soil is best, well drained with some moisture over summer. Fertiliser should be a normal Camellia and Azalea type. You can prune immediately after flowering to maintain a more bushy habit if desired, although the natural open growth habit, is to us, attractive. Camellia lapidea is available for sale from the following nurseries.